The ability to replicate patterns from micro- to nanoscale is of crucial importance to the advance of micro- and nanotechnologies and the study of nano-sciences. Nanoimprint is an emerging lithographic technology that promises high-throughput patterning of nanostructures. Our lab significantly advanced the nanoimprint technology and the scope of its application in recent years. We demonstrated a new polymer inking method that is especially useful for polymer materials such as conductive polymers and biomaterials (JVST. B. 21, 2749, 2003). We have explored a new technique by uniquely combining the nanoimprint and photolithography methods to create various size and density patterns in a single step (Microelectron. Eng. 71, 288, 2004), which solved the defect generation problems in conventional nanoimprinting and can be further extended to simplify the process by eliminating the dry etching step (Microelectron. Eng. 71, 277, 2004). Impact: Work in this area has shown that nanoimprint can enable parallel nanoscale processing capability with simple equipment set-up and much flexibility. New techniques and material development should aid the adaptation of this technique in microelectronics, micro- and nanophotonics, organic photovoltaics, and in optical metamaterial fabrications. Applications exploited in the area of photonics and nano-biotechnology significantly pushes the envelope of this technology. Impact: Plasmonic structures offer a unique opportunity for manipulating the light at the nanoscale. 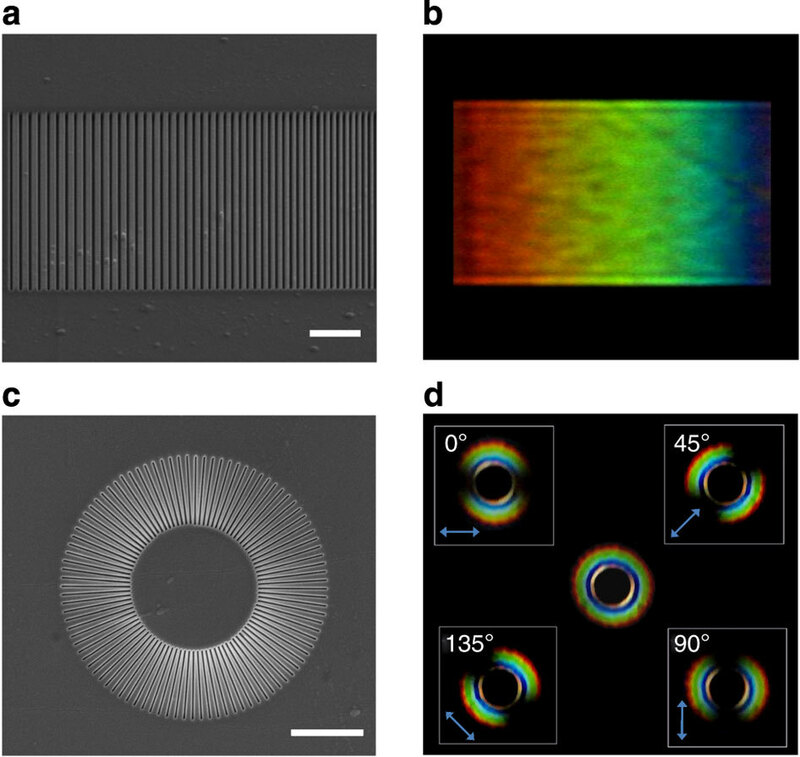 Plasmonic particle arrays provide a simple platform for label-free biochemical sensing; and are also useful in SERS sensors by significantly increasing the optical field strength. The application of plasmonic enhancement to increase the solar cell efficiency can push the development in this important area. The plasmonic resonator based color filter provide significant energy saving by providing high efficiency and polarization capability into a single element, which could greatly benefit the future LCD display. Nanoscale coherent light sources could find applications in on-chip interconnect and optical wireless communications. Organic photovoltaics (OPVs) offer a promising alternative to inorganic solar cells due to their low cost, easy fabrication, and compatibility with flexible substrates over a large area. The key issues are to increase the solar cell efficiency and to push to large area applications. Toward this end, we applied nanoimprint lithography to produce ideally ordered nanoscale morphology between the donor and acceptor domains to systematically increase the efficiency of the OPV (Appl. Phys. Lett. 90, 123113, 2007). We also identified an important issue to correctly evaluate the solar cell efficiency by the proper choice of electrode geometry, which has been overlooked by the community (Appl. Phys. Lett. 92, 133301, 2008). In an effort to find a replacement for the traditional conductive oxide ITO for organic optoelectronics, We introduced metal nanomesh structure as a versatile transparent electrode where the transparency and conductivity can be controlled by structural geometry and applied it OLED (Adv. Mater. 19, 1391, 2007) and to OPV, and showed that devices made with inexpensive metal such Cu can produce comparable efficiency as those made with ITO (Adv. Mater. 20, 4408, 2008). Such structures can be made on flexible substrate and showed drastically improved flexibility and durability than the ITO structure. Impact: The development of metal-based transparent electrode can provide high conductivity necessary to build large area solar cells without the impact of series resistance. It also shows drastically improved flexibility and offers the advantage of plasmonic enhancement. The new polymer solar cell fabrication technique is generally applicable to donor-acceptor systems where the surface energy of the two are different, which is necessary for phase separation to produce the interpenetration network of the two domains. These developments paved the way to future large area and high efficiency organic solar cells. Microresonators are versatile optical elements that provide photon confinement for many important photonic applications. Sensors using evanescent wave to interrogate the presence of analytes on waveguide surface or in surrounding environment typically rely on the detection of effective refractive index change. A great demand exists for highly sensitive devices to detect biomolecules with very low concentrations. Toward this end, our group have investigated polymer microring resonators as sensitive and compact biosensors to take the advantage of polymers' rich surface functionalities for specific attachment of biomolecules as well as low cost and simple processing. We have developed a process to fabricate polymer microring resonators using a direct imprinting technique, which can create microring devices in a variety of polymer materials (JVST. B. 20, 2862, 2002), and can stamp out arrays of microring devices in a single step. We also developed techniques to reduce the surface roughness caused scattering loss (Appl. Phys. Lett. 84, 2479, 2004) to increase the cavity Q's and improve the device performance (IEEE Photon. Tech. Lett. 16. 1498, 2004). Impact: Sensors based on optical microcavities offer a unique advantage for detecting low concentrations of biomolecules as well as studying their binding kinetics by using small sample amount and without fluorescent labels. The high-throughput stamping technique affords arrays of such sensors to be fabricated with low cost, enabling multi-channel format that is needed in applications such as drug discovery and disease diagnostics. The adaptation to ultrasound detection has led to exciting application in high-frequency ultrasound imaging for medical diagnosis by providing high-density detector arrays for greatly improved spatial resolution and high sensitivity for increased depth. The new photoacoustic correlation technique could open up a range of applications in medical diagnosis. Impact: The versatile, highly specific, and biologically friendly technique for generating ultra-high resolution protein patterns will allow the diverse activities of proteins to be integrated into microfabricated devices and sensors. It also provides a unique solution to create "grey scale" protein patterns with varied densities, which will aid the study of cell adhesion and motility and enzyme-substrate interactions. The successful demonstration of molecular sorting devices powered by motor proteins will spur further investigations and new device concepts to harvest the full potential of these highly sophisticated nanostructures provided by nature with unprecedented small scale and high efficiency. The simple technique for constructing nanochannels will provide a useful fabrication tool to perform genomic, proteomic, and chemical analysis in the nanoscale. A nanofluidic device that can conduct ion current preferentially in one direction and inhibits the current flow in the opposite direction is of great interest since it may open a new way to handle molecular or ion species in fluid, and may even shed light on the mechanism of biological ionic channels. Nanoelectronics, especially Silicon single-electron and quantum-effect devices, constitutes much of Dr. Guo's Ph.D. and postdoctoral research work. He has analyzed the first Si single-hole quantum dot transistor (Appl. Phys. Lett. 67, 2338, 1995) and demonstrated the first room temperature single-electron memory in crystalline Si (Science, 275, 649, 1997). He also applied the newly invented nanoimprint lithography technique to the fabrication of Si nanoelectronic devices (Appl. Phys. Lett. 71, 1881, 1997). He further investigated Si transistors with stacked quantum dot structures for tuning the electronic properties (Electron. Lett. 34, 1030; and Appl. Phys. Lett. 73, 3429, 1998). During his postdoc and his initial couple of years at the University of Michigan, he and his collaborators have further studied carrier transport in coupled Si-dots (Appl. Phys. Lett, 76, 1591, 2000) and coherent transport in a quantum-dot dimmer (Phys. Rev. Lett. 88, 186801, 2002); spin transitions (Phys. Rev. B. 63, 5321, 2001) and magnetic field induced reconstruction of the ground state in the few-electron regime (Phys. Rev. Lett. 87, 166802, 2001). Impact: Researches on single-electron effects in Si quantum dots have helped to build a solid knowledge base for the exploration of future nanoelectronics. Single-electron effects observed in Si nanodots have been identified by industry as a potential route to create very high density memory chips with added functionalities. Single-electron transistor has been used as ultrasensitive charge sensors in numerous applications.